My last post about 99p cheese ended up being a bit of a rant about how Britain's regional cheeses, like Wensleydale and Red Leicester, had become characterless mass-produced products, sold at rock-bottom prices by the supermarkets. But there are still a handful of farmhouse producers out there keeping the faith by using traditional recipes and techniques to make authentic cheeses with distinct personalities. My favourites are below (I've left cheddar and Stilton out on purpose because the good ones are so well known). There's nothing original about the choices I've made, but just because they're not new and fandangled doesn't mean they should be overlooked. 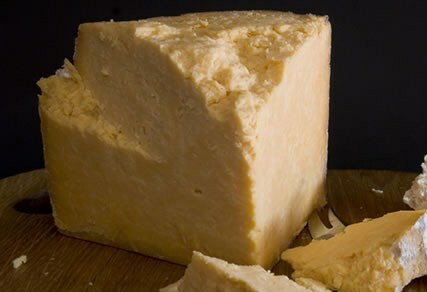 This is the only Red Leicester (pictured above) that is made on a farm with raw milk in Leicestershire. The business was set up by dairy farmers Jo and David Clarke in 2005 to resurrect the area's cheesemaking traditions, which had entirely died out. They use milk from their own herd of Holstein Friesans and the red colouring comes from a natural plant dye called annatto. It has a lovely sweet nuttiness that gets stronger as it matures. 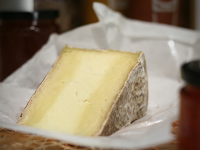 Charles Martell is best known for his washed rind cheese Stinking Bishop, but he also helped revive the production of Single and Gloucester cheeses made with milk from the Old Gloucester breed of cattle. 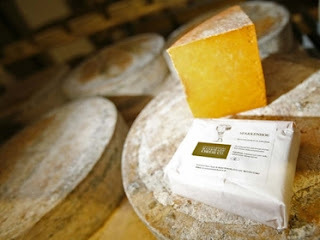 Made in Dymock in Gloucestershire with unpasteurised milk, his Single Gloucester has a mild buttery flavour, while the Double Gloucester has a dense texture and rich, mellow flavour. Smart's Traditional also make really nice Gloucesters. Pronounced 'Gor-with', this lemony semi-hard cheese is made by the Trethowan family at their farm in West Wales using unpasteurised milk. The cheese has a kind of two-tone crumbly texture with a soft creamy outer (which is called the breakdown) and a firmer band in the middle. There's a lovely tang to the flavour, backed up by earthy, savoury notes. Just a great cheese. This is a good example of how a fairly large producer can still use traditional processes to make a decent cheese. It's fairly straightforward with a crumbly texture and lemony flavour with just a bit of honey. The Hawe's Creamery is often incorrectly called the last maker of Wensleydale in Wensleydale, but there is another much smaller producer - Ribblesdale Cheese- also based in Hawes that makes the cheese. Both are well worth seeking out. It's not made in Cheshire - I grant you - but this is the only traditional cloth-bound Cheshire cheese still made in the country. Not as sharp as the supermarket Cheshires, there's a lovely savoury quality to the cheese with a nice tang at the end. Texture is fairly moist and flaky. It's made by the third-generation of the Appleby family using unpasteurised milk from their own farm in Shropshire. Several cheesemongers I've spoken to recently reckon this unpasteurised crumbly cheese is tasting as good as it ever has in its history, which is saying something considering it's been made by Ruth Kirkham for over 30 years at Lower Beesley Farm in Goosnargh. Martin Gott of Cartmel Cheeses reckons the texture is as important as the flavour, describing it as a "moist, buttery, breadcrumb-like crumble which somehow opens the flavour up". The flavour itself is a balance of lemony acidity and a rich creaminess. Cracking post! This and the '99p' post highlight the way people can perceive territorials. Personally, I struggle to shift Stilton other than at Christmas and have to persuade customers to taste cheeses like Sparkenhoe and Kirkhams. I put this down to the idea that if there's a sub-standard block version of a variety available in a supermarket, customer opinion is detrimentally affected as some perceive all examples of that variety to be the same - I often hear people say "Cheddar is cheddar" - much to my dismay!